Cut the Sugar, You’re Sweet Enough is a practical, real-life approach to reducing sugar the healthy way so you don’t feel deprived. 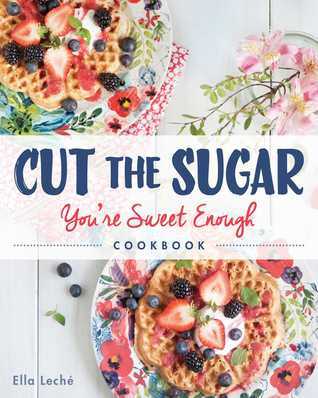 This is not a sugar-detox book but an inspiring cookbook and guide to change your relationship with the foods you love and address your cravings properly. There are over 100 delicious and easy recipes for breakfast, lunch, dinner, snacks, and yes, even dessert! I picked up a review copy of Cut The Sugar in November as part of my attempts to eat healthier. It is the work of blogger Ella Leché, and I checked out her blog, Pure Ella, before requesting a copy. I liked what I read and saw – which included some great looking food. The book opens with Ella’s own story, and the reason she started her blog. In a nutshell, back in 2008, she developed a rare autoimmune condition. Medication wasn’t working so she started to try and heal herself naturally…which included not just healthy eating (or what she had thought of as healthy eating) but making significant changes to the way she eats. The main change was cutting out sugar and the result was she felt better – regaining her good health. It is a change a lot of people are making and one suggested in Eat, Nourish, Glow which I also read in an attempt to change my diet. The difference here is I didn’t feel beaten over the head with the message. Ella isn’t dictatorial and there is plenty of fruit in her recipes that it isn’t like you give up sweetness, just the processed kind. After telling Ella’s story and sharing tips for healthy eating, the book presents recipes for each part of the day, including snacks like biscotti, and deserts. The recipes were beautifully photographed and had me wanting to try them. Plus they were meat-free, great for a veggie like me – I had some as mains whilst my husband had them as sides. I haven’t been through all the recipes yet but those I have tried have been easy to follow and easy to make. The overnight chia oats are now a breakfast regular and the salads have made my packed lunches healthier and more interesting. I wish I could take photos that do them justice but food photography isn’t my forte so I am afraid you will have to go on my recommendation – which is this is a book for those who want to be a little healthier without feeling deprived. As mentioned in the post, I received a copy of this from netgalley in return for a fair and honest review. All thoughts and feelings are my own. Oh this does look interesting! I’d like to mix some healthier food into my diet and I’m trying to step away from sugar a little. This sounds like a book I need to check out! It is definitely one you can dip in and out of. And so pretty!